Have you heard of the Google Apps Marketplace? It is Google for Work’s online marketplace of applications that have been integrated with their platform for your convenience. Recently, JumpCloud’s Directory-as-a-Service® platform was added to the Google Apps Marketplace. 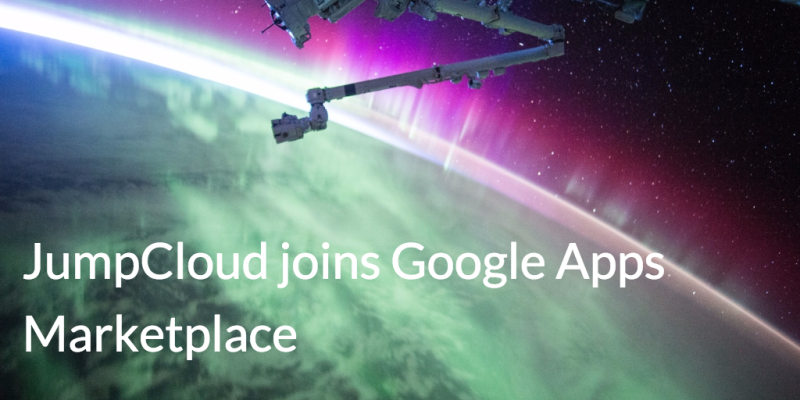 Now that JumpCloud’s cloud-based directory service is readily available from Google Apps Marketplace, Google Apps admins can easily add it to their infrastructure. Admins can leverage their Google Apps credentials to simply sign-up for the virtual directory service. JumpCloud’s Directory-as-a-Service securely connects employee identities with the IT resources that those employees need, including systems, applications, and WiFi networks. So, what’s one of the benefits of JumpCloud’s identity provider? Well, Google Apps organizations can now leverage their user’s Google Apps identities in more places. Currently, Google Apps Directory is focused on providing authentication services for Google applications and some select web-based applications. The challenge for IT admins is how to connect all of their IT resources with the same identities that are used to access Google. Integrating JumpCloud with Google Apps is a straight forward process. All Google Apps identities can be imported into JumpCloud’s core user directory. Those identities can then be connected to systems such as Windows, Mac, and Linux OSs. Cloud infrastructure, which is hosted at AWS, Google Compute Engine, and others, can be tied to Google Apps identities. Applications hosted on-prem or in the cloud can also leverage the core directory service from JumpCloud. Furthermore, Google Apps identities can be used for WiFi authentication. JumpCloud’s directory services platform extends Google Apps to the rest of the IT infrastructure. Google Apps has made tremendous progress since replacing Microsoft Exchange and becoming the productivity solution of choice. In fact, over six million organizations with over sixty million users are leveraging Google Apps. While Google Apps can replace the legacy email server, it is not a replacement for Microsoft’s Active Directory. As a result, Google Apps customers wind up with parts of their network residing in different places: on-premises and in the cloud. By extending Google Apps with JumpCloud’s Directory-as-a-Service platform, IT organizations can completely shift to the cloud. If you would like to learn more about how Google Apps and JumpCloud’s cloud directory service integrate, drop us a note. Or, feel free to sign-up for a free account. Your first 10 users are free forever.